Maleficent comes at the end of a ludicrously crowded and financially disappointing May 2014 schedule. It hopes to be a box office hit in the style of CGI heavy Disney flicks Alice in Wonderland and Oz: The Great and Powerful, and with Angelina Jolie starring you can hardly go wrong. But wait. Yes. Yes, you can. 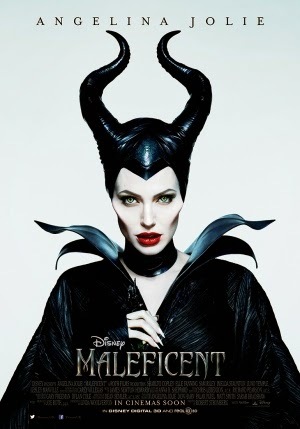 Maleficent retells the classic story of Sleeping Beauty from the perspective of its iconic villain, played superbly by Jolie. Long before her descent into evil, Maleficent guarded the magical land of The Moors as an elegant faerie with a stunning pair of wings. When her wings are eventually stolen in a heartbreaking betrayal, Maleficent curses the firstborn Princess Aurora (Elle Fanning) of the nearby kingdom whom she holds responsible. Aurora is taken into the forest to be guarded her curse, but only encounters and grows closer to Maleficent, who has watched over Aurora since childhood and begins to develop regret for her sinister actions. Maleficent struggles to find the true focus of its story, or perhaps it just can't deliver it with enough emotional strength. Anyone who has researched the film may know that the opening 20 minutes or so had to be reshot due to such clumsy direction and if this is the final cut, I hate to think what the original version looked like. The opening does nothing to make us like or care for these characters; instead, it's 20 minutes of necessary setup to make the rest of the plot make any sense. It gets boring relatively quickly and in the end I was just waiting impatiently for Jolie to actually become the villain I saw in the film trailers. To create a narrative over these 97 minutes, they've forcibly stretched simple scenes and half of the film feels completely pointless. Not good. The CGI heavy nature of the film creates some lush landscapes and visual thrills galore, but there's sometimes a very synthetic feel to almost everything you see, especially the three pixies whose blend of actual actor's faces onto small CGI bodies is absolutely terrifying. That aside, the visuals are one of the film's strongest merits; the other being Jolie's performance in the title role, which is far from award winning but still superb given the weak material she must work with. But these factors aren't enough to save Maleficent from what it is; a boring, poorly focused and joyless mess, which ruins one of Disney's best villains by turning her into a misunderstood hero and slapping her into a poorly directed visual effects showreel.